There are some things that are such a pleasure to do, to pass along, to endorse… it kind of feels like cheating, like “duh” this doesn’t even have to be said. I love the Duarte group. Their talent, their staff, their ethic, their genuine passion, all so refreshing and inspiring. And when they produce something you, Joe and Jane Everyone, can hold in your hand for a couple of bucks, well that’s really cool. 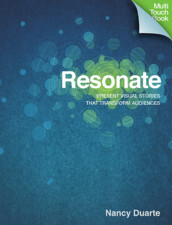 Today Nancy Duarte announced on the Duarte blog the publication of the iPad version of their book Resonate. And I’m going to stop right there. No further loving hyperbole. No more glowing endorsement. Just one instruction that will cost you absolutely nothing. If you have an iPad, click here to get to the iTunes page. There it’s easy to download the free sample of a section of Resonate. Watch that. Read it. You’ll be captivated from the first match strike, from the inspired visualization of how an idea travels between people, the power of a speaker and audience connecting, and then you’ll start to learn to do it yourself. Yeah, that was really easy. This entry was posted in Business, Design, Geeking around, History, Home and Family, Media, Movies, Software, Travel. Bookmark the permalink.